In all my years weaving I think I’ve only used this warping configuration once before tonight, but I could be wrong. 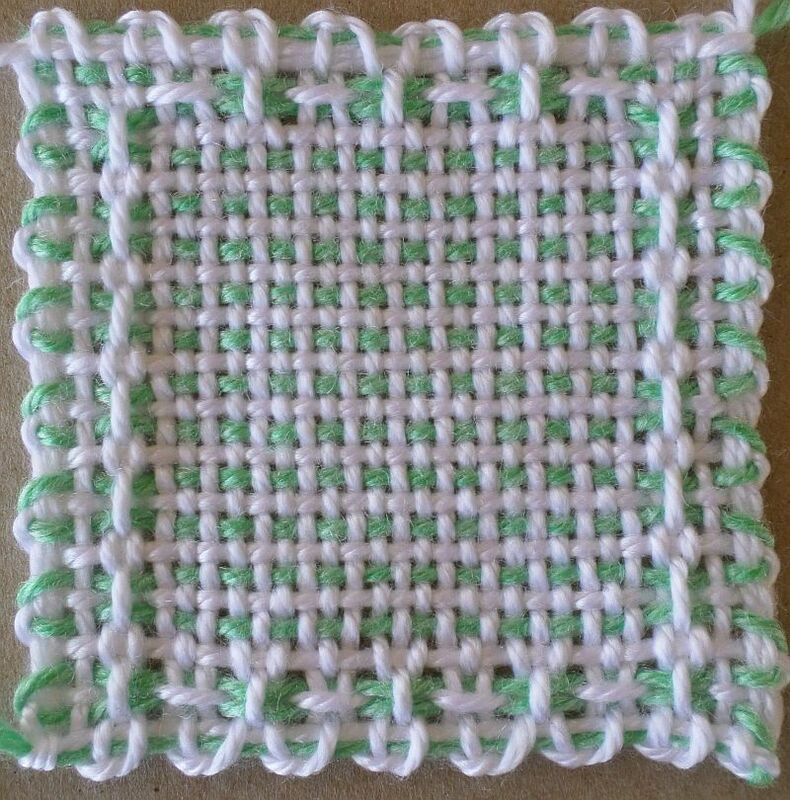 In the green-and-white finished sample square you can see the interesting effect, along the top and bottom, of changing colors L2-only, so I’d say this configuration is worth exploring. The procedure for L2-only color change is similar to changing for L3-only. 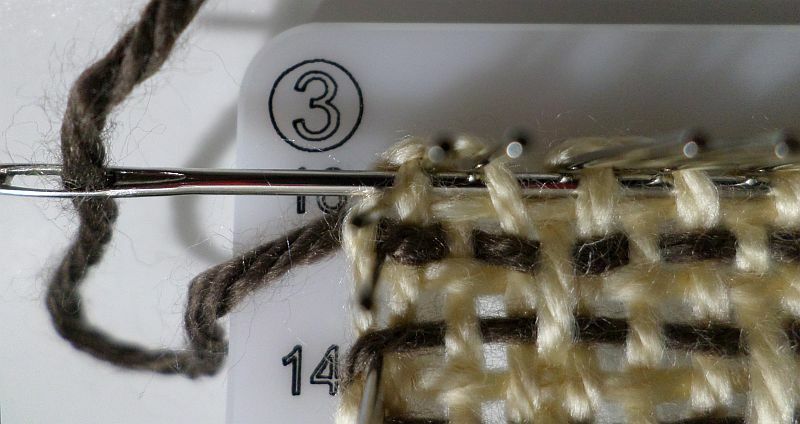 To balance the appearance of the overall square, it might be advisable to use a slightly thicker yarn for L2. Tie on at Cr4 (I chose the first pin of the four-pin group), take yarn outside 2-4 side pins to Cr2. Warp L1 backward: bring yarn up to Cr4, wrap pins 3 and 2. Continue back and forth wrapping pins 3 and 2. Tie on L2 in the usual place, near Cr1. Warp L2 as usual, ending at Cr3. At Cr3, bring yarn around top edge of loom (3-4 side) and tie off L2 near Cr4. Bring L1 yarn up from Cr1, along outside of 1-3 side pins. Warp L3. 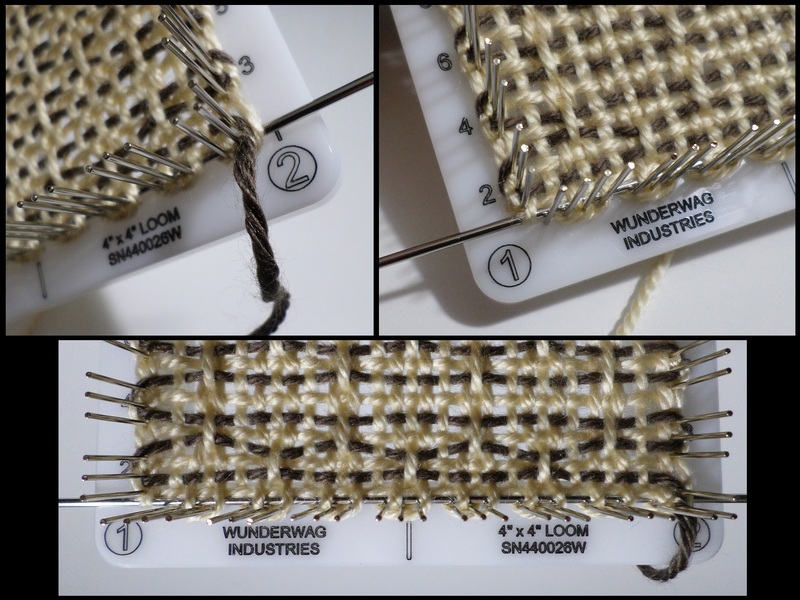 Make sure to keep the reverse slip knots (RSKs) from L2 accessible (you may need to remove them from the loom while warping L3). 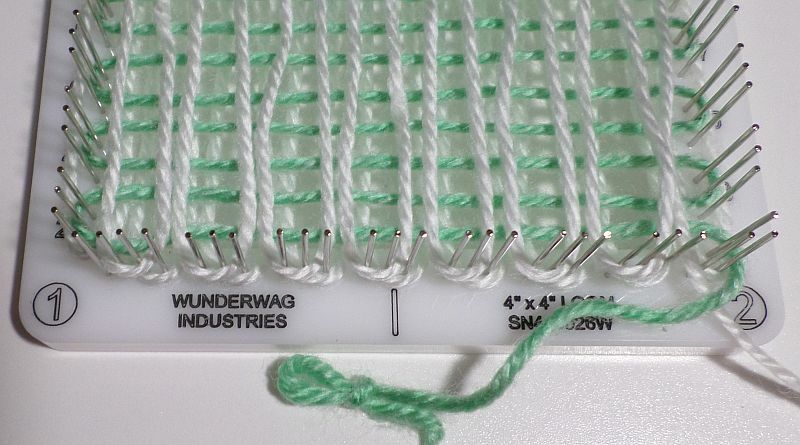 VERY IMPORTANT: Remove L2 RSK from loom, take it OVER the last warp of L3, then replace it on the loom. 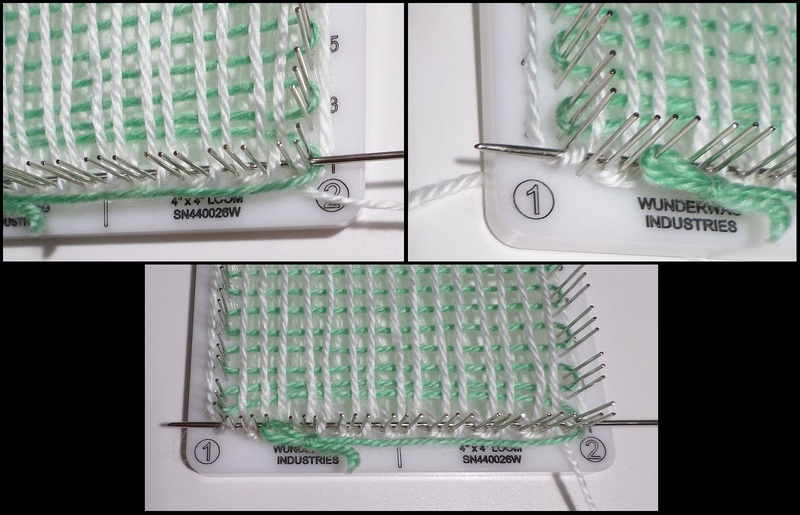 Measure L4 weft, cut, thread needle and you’re ready to weave. 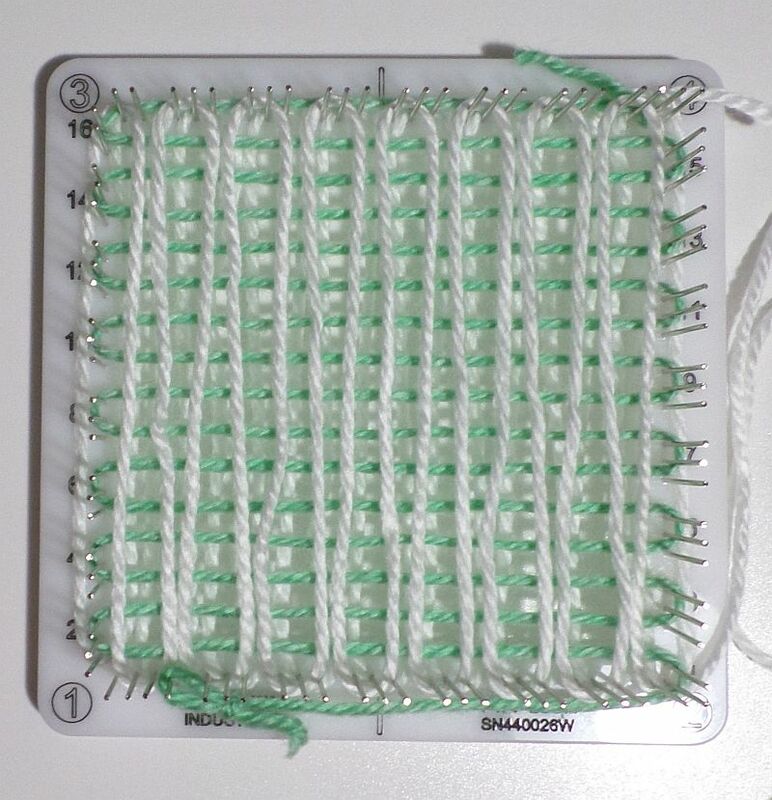 R1 Beginning: Needle enters at Cr2 in the usual manner—through the outer loops, UNDER the first warp. R1 End: Exit the row taking needle UNDER the last warp and OVER the outside tail. You will have to pull the warp/tail downward to get the needle through. Third photo shows R1 with needle in place. 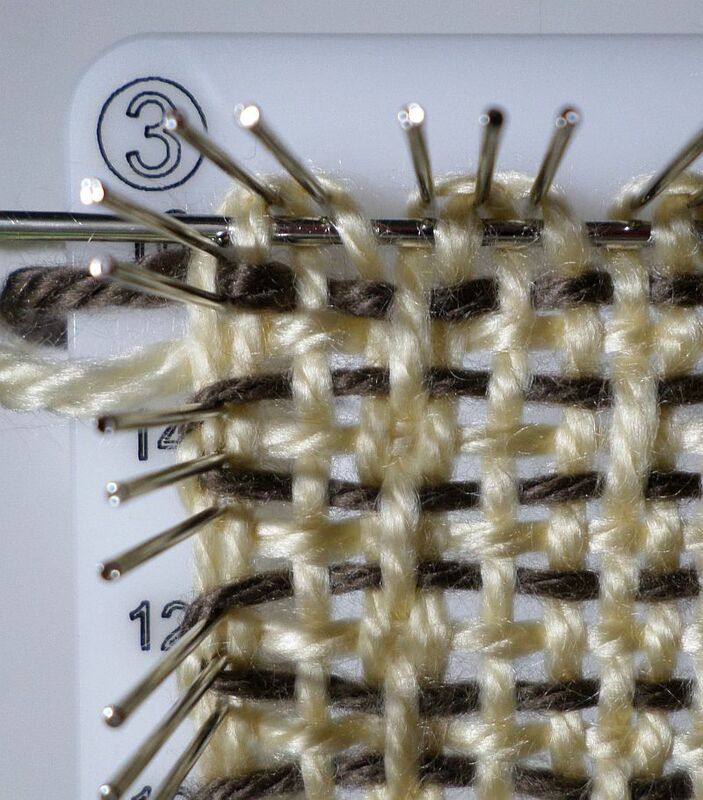 Continue weaving in the usual working-in-ends-as-you-go manner, and following your pattern instructions. Work in L2 beginning tail as usual: UNDER outer loops plus first warp at Cr2; follow R1 path and exit through the loop—exactly as done in R1. 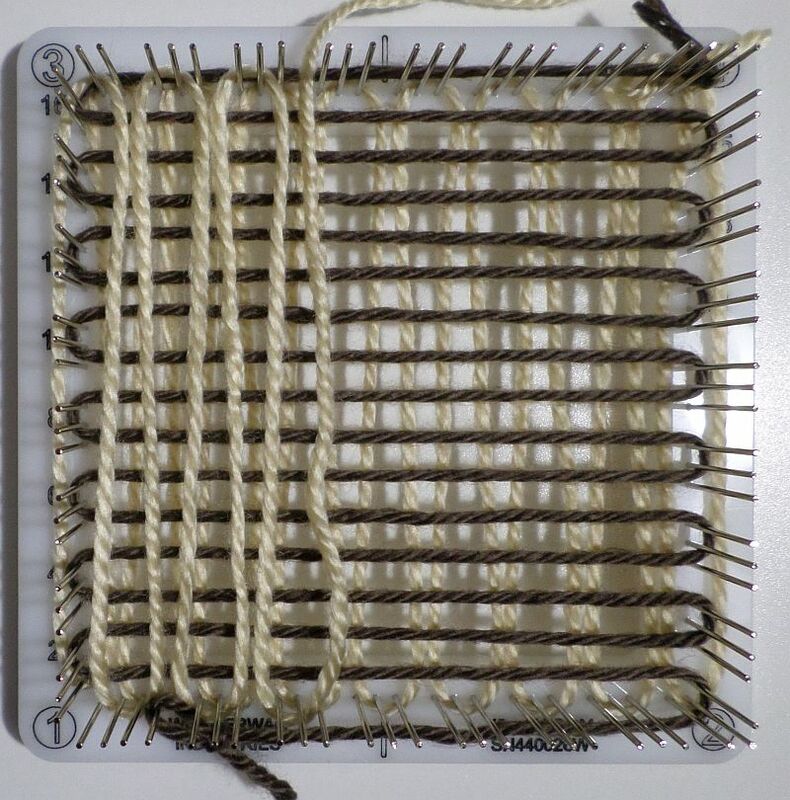 At beginning of R16 (last row), release L2 end tail from the loom and bring it away from the loom. Weave R16 as usual. 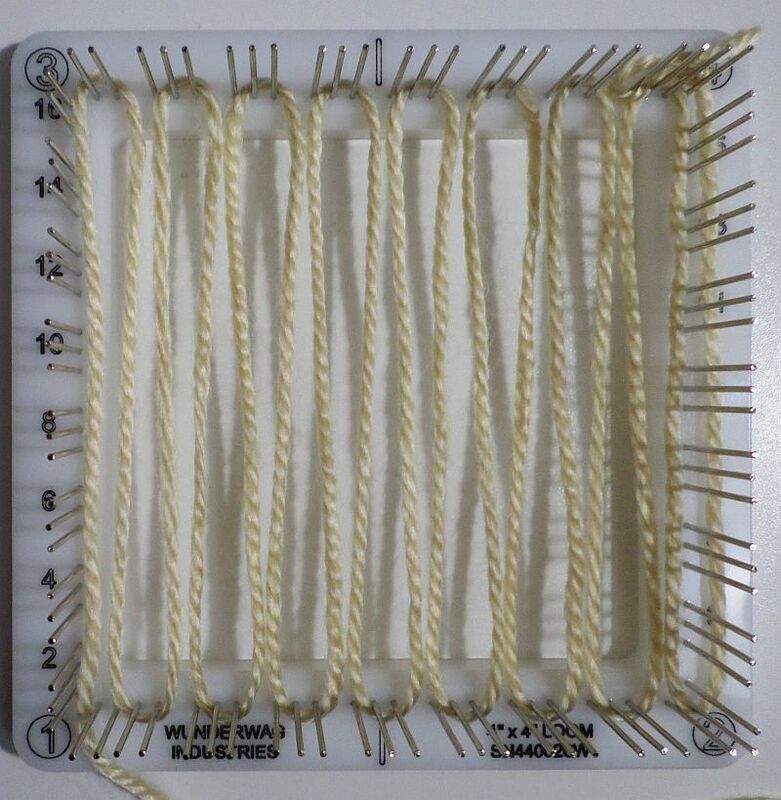 Close-up of R16 beginning, needle in place—L2 end tail released from loom and hanging to the side. Work in L2 end tail by bringing it OVER outer loops at Cr3 and UNDER first warp. Follow R16 path across. For the L4 end tail you have to choose where to triple up. I chose to work it in along the 2-4 side of the loom. 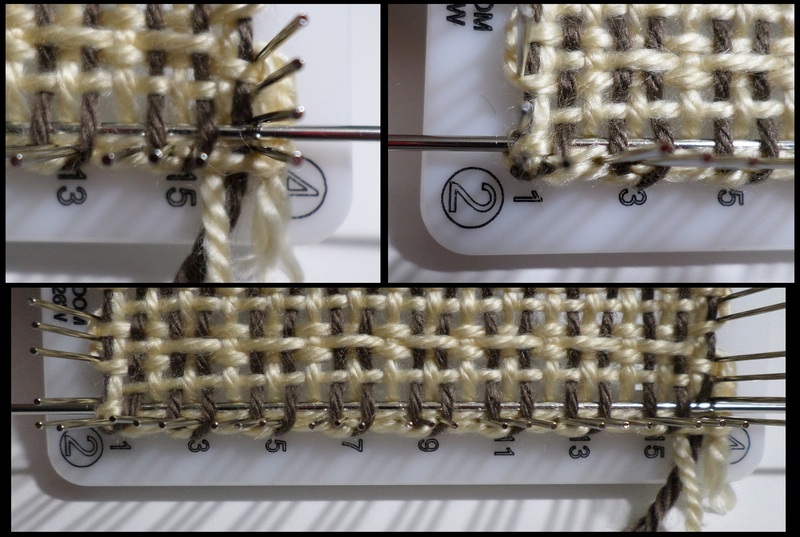 Go over two wefts at Cr4, follow path of warp #31. Exit through the clump at Cr2. The Checkerboard pattern didn’t turn out as strikingly as I’d hoped. Had I used a significantly thicker yarn for L2 I think it would look better. 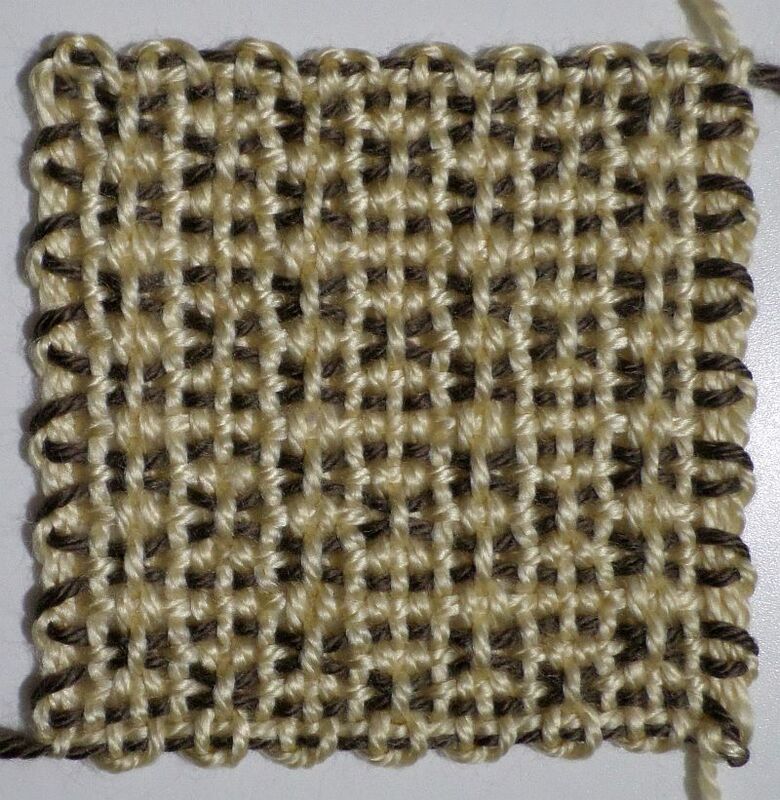 In 3-and-3 variation both yarns were thicker than the yarns I used for Checkerboard 1. I think this looks a little better. Notice on this square I chose to work the L4 end tail in across the top of the square.